Did an interview with Al Korelin on the weekend. Covered China, the challenge ETFs present to gold mining shares, World Gold Council's purpose in creating the ETFs and institutional demand the Perth Mint is seeing and how we are only in phase two of a bull market. I forgot to post that TF Metals Report responded to my response to Andrew Maguire's article on price suppression mechanics. Gene Arensberg did a post on my November 30 article. I watched it for a few days but no one commented so I stopped checking it. A day later on the 5th blogger Dave In Denver posted some comments, which I missed. TF picked up on these comments a day later, turning them into a post titled Cage Match: Bron vs. Denver Dave. Dave's main beef seemed to be that I didn't critique GLD and was thus an apologist for the ETFs. He completely missed the point of my response, which was solely about addressing the suppression mechanics. I do not recommend ETFs for anything but short-term trading. If you don’t hold it in your hands, you have counterparty exposure - period. Allocated with bar numbers in a non-bank vault does not have some magical force-field that stops it from being stolen. You are trusting your custodian. If you hold it in your hands, you have theft exposure. All precious metal investment has risks, only you can decide what risks you are comfortable with. Don’t let anyone tell you that you are an idiot for storing it yourself or for storing with a custodian. If you don’t understand a prospectus/agreement, stack physical. If you don’t understand a company’s business model (which includes the Perth Mint’s “use in our business” unallocated), stack physical. The third last one is one that annoys me whenever I see it - this judgemental attitude that you must hold your metal without any consideration that what is right for you may not be right for someone else. I wasn't expecting much comment one way or the other. TF posts so frequently that the circus moves on and unless you can comment within the day of the post it is too late, which is difficult for me being 12 hours behind. I do not like getting into this sort of infighting but as everything lives on forever on the internet and if you don't reply the claims stand and become accepted as fact. This whole negative dynamic is not good as I agree with Gene Arensberg's comment (where Dave's comments originally appeared) "In fact they succeed only in one respect - of confusing and turning some people off to the entire sub-sector. It is a pity they do not realize that one cannot poison just part of a well." My response will also be a handy reference link to give next time I'm accused of being a bankster shill. I suppose it reflects the fact that the TF Metals Report has a client base who are just buy and hold type stackers. They have made their decision and thus most of them aren't interested in debating or learning, they are primarily there for entertainment. TF's use of "army" imagery and the "cage match" characterisation are indicative of that. Nothing wrong with that, except that I don't know how they are going to know how to assess when to sell their metal, which is something they will have to work out for themselves because it is doubtful TF or Maguire (or many people selling gold products) will do it as it doesn't help your business model to tell your clients to leave. However, if they haven't spent the bull market thinking critically and trying to understand the market's dynamics, it is likely they will get the exit all wrong. The true test of who the charlatans are in this business will be those who continue to say buy buy buy all the way through the bubble top as they try and squeeze every last bit of profit out of their clients before they close up shop and move on to the next story. These comments on the LBMA Liquidity Survey come from FOFOA's blog. I've assembled them here for my future reference convenience and are probably of interest to about four people. See also this post for earlier comments on the survey. To the extent that the clearing banks have the same mix of clients there would probably never be any sustained/ongoing movement of physical from one to another as over time a bank's flows would net. However if the mix of clients is not even (eg one bank predominantly has mining/selling clients and another has jewellers/buying clients) then there would be ongoing movement of physical from one clearer to another. 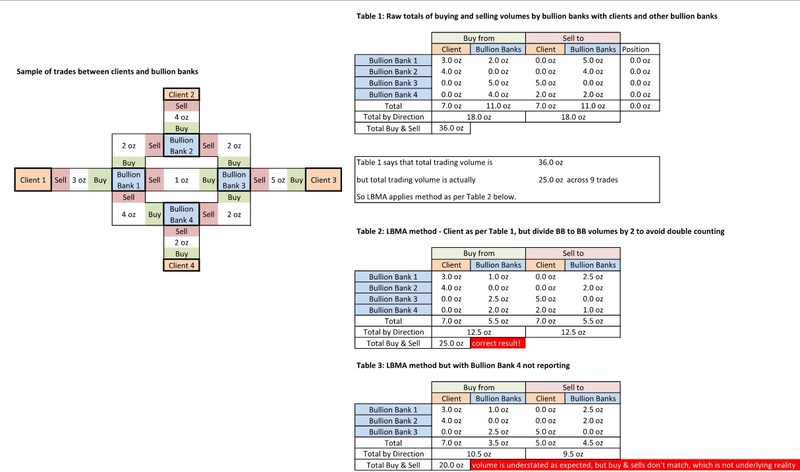 This was a debate I was having with FOFOA around the LBMA survey imbalance as if the mix of clients between banks is not symmetric then you will have an imbalance in the trading reported (yes, I have not forgotten, it is still on my to-do FOFOA). FOFOA doesn't think so, I do, but maybe I need more time to get to where he is. Fwiw, that survey was actual reported volume (divided by two in the table so as not to double count). Any additional banks reporting would only have added to the total. Even if the rest did the smaller volume, that would not have reduced those totals given. So that is why it can be taken as a minimum. That's right MF, but the question FOFOA (and I) had was whether LBMA in aggregate sold more unallocated ('gold') than they purchased. The net difference between purchases and sales was some 7500t over the surveyed quarter, and this is too much to be hedged in non-LBMA 'gold' instruments such as COMEX, TOCOM etc. So if they indeed sold more than they bought, this would indicate that they are not flat 'gold', but that they rather delta-hedge their net exposure to 'gold' using correlated instruments, say AUDUSD, CADUSD etc. The question that got us there was the question of why the 'gold' price goes up after a GLD puke. The puke is just a small amount of physical, say about 13 tonnes, which is a lot less than the 2700 tonnes of paper that are traded every day. So how can that little puke move the price over the subsequence 2-6 weeks? If LBMA in aggregate does delta-hedging, this might be the explanation: after the puke they shift their hedge from 'gold' correlated instruments to proper 'gold', thereby running up the 'gold' price. (They would lose a bit due to friction if they do this, but, hey, you are the market maker and if you fleece everyone by a fraction of a percentage point, you should still come out even). If Bron is right, and LBMA in aggregate is flat 'gold', then the GLD puke indicator still awaits an explanation. My suggestion as to why the GLD puke indicator may work is that in the fact of net selling the APs and others will use all and every means to arbitrage GLD to spot except redeeming (as that has a slight cost). They would build up "stock" of GLD shares in the hope they can resell it later (and avoid redemption and subsequent creation costs). If the selling continues they build up too much GLD shares (long) and too much leased unallocated (short) so at some breakeven point it is less costly to redeem GLD and collapse the hedge. These capitulations by the APs signal their assessment that the selling is "real" (ie not temporary). On a sentiment basis this represents a low point, from which on probabilities, the price has more of a chance of rising. Just a theory. I'm glad to see that you brought this up again, because I was just explaining my take on our debate to Joe Yasinski and Dan Flynn of GBI the other day. Did you happen to see that they mentioned the discrepancy in the LBMA survey in their latest post? The way I explained it is basically this. We have three proposed explanations for the 7,575 tonne (aka $337B) discrepancy between purchases and sales in the 1Q11 LBMA member survey. As you correctly pointed out, it is likely a combination of these explanations, because as I recall you finally conceded that the discrepancy is far too large to be solely explained by the survey methodology. But even still, that "halving of interbank transactions" is our first of three explanations. Bron's explanation is that there is a difference in clients between the LBMA members who chose to report on the survey and those who chose not to report, and that this difference informed their decision of to report or not to report. In order for Bron's explanation to explain the entire discrepancy, there needs to be a flow of physical gold twice the size of the discrepancy, or 15,150 tonnes (7,575 X 2) from the non-reporting members to the reporting members and then on to their (the reporting members') clients. It must be double because of the halving of the interbank transactions in the survey. This is simply a ridiculous notion given of the sheer size of physical gold flow (15K tonnes of physical in one quarter) required to explain the entire discrepancy between purchases and sales given the methodology of the survey. But Bron may have a point that, on some level, certain types of LBMA members might have been more prone to report than others. His theory is that the BBs selling to Giants and industrial users are reporting, and the mints and refineries buying from mines and scrap dealers are the non-reporting members. Something like that anyway. So that phenomenon might contribute to some of the discrepancy. So how much? As you point out in your post, new mining supply in one quarter is only about 625 tonnes. Add some reasonable number for scrap supply and then halve the total, and that's the very most that Bron's explanation could account for in the discrepancy. So let's say (generously) that 500 tonnes could be accounted for by asymmetric reporting. And that leaves my explanation as the winner for the remainder, IMHO. "Based on the survey, we deduce that in 1Q11 excess demand for gold was 243,560,000 ounces which translates into approximately 7,575 metric tons. In a typical year, quarterly physical production (new mining supply) is approximately 625 tons. One would imagine that with a traditional commodity, physical demand outstripping new supply in a given quarter by a factor of 10 would cause a significant increase in price!!" Is really not a correct way to look at it, because the 7575t is not all physical demand and 625t is not the only physical supply in that quarter. "...there needs to be a flow of physical gold twice the size of the discrepancy, or 15,150 tonnes (7,575 X 2) from the non-reporting members to the reporting members and then on to their (the reporting members') clients." The survey was of bullion bank trades/turnover, which would not relate to flow of physical gold. The reason I'm not so keen to jump to a conclusion is I have an idea of how trades (paper and physical) are recorded in trading systems and the errors that are likely to inflect the data based on how the database was interrogated. For example, head of precious metals passes on LBAM request to IS guy who has a lot on their plate, they run a query which they think is OK, but they haven't thought about whether the two legs of a swap should be treated as two trades or one, or if they have excluded reversing (error) trades out etc etc. Then assuming no errors I need to think through typical transctions and how those may be reported once summarised into the LBMA requested data and whether they will result in the correct result, which is what I'm trying to do with my spreadsheet. And I think you are underplaying the importance of a correct/representative sample size in determining statistical significance. That sort of stuff relies on normal distribution and representative samples. If a certain group bullion banks of the same type have not reported for strategic reasons then you can't rely on statistical assessments but need to go back to understanding the underlying data. If asymmetric reporting is to account for the discrepancy, then "there needs to be a flow of gold twice the size of the discrepancy, or 15,150 tonnes (7,575 X 2) from the non-reporting members to the reporting members and then on to their (the reporting members') clients." I removed the word physical. Do you still disagree with the statement given this change? "I removed the word physical. Do you still disagree with the statement given this change?" "there needs to be a flow of gold twice the size of the discrepancy, or 15,150 tonnes (7,575 X 2) from the non-reporting members to the reporting members"
So from a simple model of 56 banks summed buys and summed sells with each other bank (a total 3136 bank-to-bank data point relationships) with random data we get a overall 56 bank universe trading position of 17t over 17734t of turnover. However, that minimal net position of 17t "appears" when we look only at the reporting banks to be a 153t position over 11407 of turnover. The key point is the non-reporting banks are net short 136t. The mathematics don't work out as you think. The very idea of your asymmetric reporting explanation for the discrepancy (as you are standing it in opposition to my explanation) represents a net flow from LBMA members more heavily weighted in one kind of client (selling clients) to BBs more heavily weighted in a different kind of client (buying clients). We are both operating on the premise that the banks are not exposing themselves to a large net-position. Your explanation opposes mine in that the banks' "net-neutrality" comes from the non-reporting members as opposed to derivative hedges in other markets as described above by Victor. This neutrality would obviously be reflected in a net-neutral position, aka an "All Banks Discrepancy" that is zero or much smaller just as your model puts forth. So I think that in your example above you are conflating statistical insignificance and the asymmetric reporting explanations. Let's stick, for the moment, to the question of my statement about the flow required for your asymmetric explanation to fully suffice. My statement would therefore be adjusted to read: "there needs to be a flow of gold twice the size of the discrepancy, or 306 tonnes (153 X 2) from the non-reporting members to the reporting members"
We are both assuming that the individual banks (as well as in aggregate) have no (or little) net position/exposure. So what we are seeing in this toy LBMA survey is that the reporting banks are short vis-à-vis their clients but long vis-à-vis the non-reporting banks in nearly equal amounts so as to be net-neutral. And the non-reporting banks (because they are more heavily weighted with selling clients like mines and the Perth Mint) are long vis-à-vis their clients and short vis-à-vis the reporting banks (which have more buying clients). All in all, the banks themselves are net-neutral (or at least close to that; your model shows them with a real net position almost an order of magnitude smaller than the reported discrepancy). The point is that your reporting members in aggregate hold the same (or similar) net position in magnitude, but opposite in direction, vis-à-vis their clients and vis-à-vis the non-reporting members as the non-reporting members hold in aggregate. This is the asymmetric reporting explanation! So if the banks are essentially net-neutral, why are we seeing any discrepancy at all? We are seeing it because only the interbank transactions were halved, not the client transactions. So the reporting members are net short vis-à-vis their clients and net long vis-à-vis other banks in equal/similar amounts, yet because we halved only the trades with other banks, we see a discrepancy of 153t. So the discrepancy is the product of the halving the directional net flow, therefore the magnitude of directional net flow must be twice the discrepancy. This applies in all of your models, from your simplest to your most complex, if we assume asymmetric reporting. "For whatever portion of the discrepancy asymmetric reporting is to account for, there must be a flow of gold twice the size of that portion of the discrepancy from the non-reporting members to the reporting members and then on to their (the reporting members') clients." Do you still disagree with the statement given these changes? Bron, your model is describing asymmetric reporting, intentional or not, so you really should consider this flow issue and whether it makes any sense at larger magnitudes like we saw in the actual survey. In your model we can peek at the non-reporting banks and thereby know the "all banks discrepancy" which your model is keeping low through asymmetric reporting. But asymmetric reporting requires this flow, and if you can get your model to spit out a 4.35% discrepancy like the real survey while still keeping your "all banks discrepancy" low then it requires that much larger (and therefore that much less likely) of a net-flow from one group to the other. If, on the other hand, you allow the "all banks discrepancy" to rise (perhaps offset by derivatives in other correlated markets), you eliminate the asymmetric reporting and the need for this unlikely net-flow of gold, be it paper or physical. So whatever the actual net-flow from non-reporting members in aggregate to reporting members in aggregate is in reality, half of that number is the portion of the 7,575 tonne discrepancy which can be accounted for. If it's not the whole thing (i.e. 15K tonnes in one quarter), then that forces your "All Banks Discrepancy" up which is a net-position they must be hedging elsewhere. You wrote: "However, that minimal net position of 17t "appears" when we look only at the reporting banks to be a 153t position over 11407 of turnover. The key point is the non-reporting banks are net short 136t. The mathematics don't work out as you think." Your statement backs my point. You need the non-reporting banks to be net in the opposite direction which requires a net flow of twice the discrepancy. My math is fine. I think the true net position is higher, close to the reported discrepancy, and that the non-reporting banks are probably not as different from the reporting banks as to be exactly opposite as your model requires to keep the "net position" low without the need for derivative hedges. "Do you still disagree with the statement given these changes?" Yes, because I'm running various iterations of my toy model and it doesn't produce such a flow. I can produce a situation where net overall the buying and selling of clients is net and banks are net, but still result in a reporting banks discrepancy with no x2 flow between reporting and non-reporting. Note also that just because overall BBs are net doesn't mean that all individual BBs are net. My model isn't perfect and I want to refine it, but I think the interaction of 56 banks trading with each other is more complex than you realise. I think the idea the BBs are naked short massive amounts is unrealistic, but I think "offset by derivatives in other correlated markets" is pretty close to unrealistic as well. I'm going to have to leave this here and maybe I'll get time over Christmas to look at my toy model and come to understand the dynamics of 56 banks better and get back to you. I the meantime, letting Joe think this is a 100% resolved issue, and then him misapplying it to say there is 10 times more physical demand than physical supply is not right. I can see an incorrect meme starting from that. "Yes, because I'm running various iterations of my toy model and it doesn't produce such a flow. I can produce a situation where net overall the buying and selling of clients is net and banks are net, but still result in a reporting banks discrepancy with no x2 flow between reporting and non-reporting." Also, I never claimed that the LBMA survey was showing "10 times more physical demand than physical supply". First of all it's not physical demand, it's paper "foreign exchange" demand for gold held and traded as a currency, and in the case of the survey it was only one quarter. I'm guessing that the next quarter demand was probably flat and the quarter after that a lot of that paper was probably unwound/sold. So it's not constant demand. It's that demand *shocks* in both directions are being absorbed more so by paper expansion/contraction than by simply letting the price take care of it. Like a shock absorber. I don't think you are accounting for this "FOREX currency use" of unallocated gold which could easily overwhelm the gold market at current prices without such a shock absorber. Regarding complexity, you wrote: "I think the interaction of 56 banks trading with each other is more complex than you realise." The LBMA asked for reporting down to the individual trade, and the survey even reported the total number of trades (385,852) broken out into purchases (184,140) and sales (201,713). The daily average number of trades was 6,125 over 63 trading days among 36 reporting members. So each member reported, on average, 170 gold trades per day, averaging 81 purchases and 89 sales per day. We can even calculate the average size of each transaction, although it will be off a little due to the interbank halving. The average individual sales trade was $38.4M+. And the average purchase trade was $40.3M+, or a little less than one tonne per trade. "The key difference between your random iterations and mine is that you are keeping the magnitude of complexity the same with each iteration. I was comparing different magnitudes of complexity. Whether we randomize the individual transactions or the choice of reporting banks doesn’t make a big difference because the point of my exercise was that the more complex the model, the lower the discrepancy. You picked a specific level of complexity – 3,136 transactions – and then you reiterated that model and found that the average discrepancy (for your model) was .11% and the maximum was 2.96%. What I did was to simply run 1 iteration on 3 different models of gradually increasing complexity. The fact that I randomized the reporting banks and you randomized the size of the individual trades is inconsequential. It’s also inconsequential whether we had 75% reporting or 64% reporting. I’m calculating the percent a little different than you. I’m saying there X% more sales than purchases, and you’re saying there are X% less purchases than sales. That’s why you came up with 4.35% on the LBMA survey and I came up with 4.5%. But that’s not a big deal. The LBMA survey reported a total of 385,852 trades. If you want to try skewing the reporting banks toward sales, that’s fine. But you need to run comparisons of increasing magnitude, not just iterations of the same magnitude. I’ll bet if you keep it realistic we’ll see the same results… it’ll still trend toward zero too quickly." Perhaps you could expand on how you are taking into account more complexity than I realize. "So your new model has a complexity of 3,136 trades ... The LBMA survey reported a total of 385,852 trades." That statement tells me you do not understand how the LBMA survey was constructed. If every bank reported the LBMA could only have got a maximum of 3,136 data points. The LBMA was not given 385,852 individual trades. It doesn't matter how many trades or clients it did, it will only report 4 data points to the LBMA. BTW, I had not thought about this "So each member reported, on average, 170 gold trades per day, averaging 81 purchases and 89 sales per day." 170 trades per day is impossible, that makes no sense to me when I look at how many individual trades we do with bullion banks per day. Those "trade" numbers must, at a minimum, be net settlement with a counterparty. For example, if a BB bought 5 times from client A and sold 6 times to client A on one day, that was reported as 1 sale trade. On average each BB having net settlements with 170 of its clients/other BBs each day makes more sense. I am going to have to write to the LBMA about that survey. Of course the banks didn't report each trade to the LBMA. The banks essentially performed their own internal survey and then reported the aggregate numbers to the LBMA. "That statement tells me you do not understand how the LBMA survey was constructed." The point is that 385,852 is how many trades (or net daily settlements with individual counterparties as you pointed out) are reflected in those aggregate numbers we see on the survey. Each trade (or net settlement) is presumably the result of some counterparty's independent decision(s) and subsequent action(s). So the coordination of actions essentially rests at the (resolution) level of the trade (net daily settlement per counterparty), which was, on average, around $40 million. The point of running iterations at increasing levels of complexity (increasing numbers of presumably random trades/daily counterparties) was to show you that the more presumably random trades you aggregate, the lower the expected discrepancy (deviation) between purchases and sales after applying the statistical methodology of the survey. As I showed, at 9 random trades, we found a 10% discrepancy between purchases and sales. But as we increase the number of random trades, we quickly drop toward zero. Even at 3,136 trades we were close to 1% discrepancy on average. In fact the largest discrepancy/deviation your model produced after 100 iterations was 2.96% and the standard deviation was 1.21%. This is compared to 4.35% in the actual survey. Can you see a trend forming here? Does this next one fit the trend or stand out? There's a point here which you don't seem to understand. The point of looking at it this way is to help us determine if the 4.35% discrepancy/deviation found in the actual survey is statistically significant or insignificant. Clearly it is significant, and therefore it requires an explanation beyond the "halving methodology" under which the survey was published. We are well past this point, but you don't seem to understand that, because you keep coming back to your model trying to tweak it, make it more complex, or reiterate it enough times to get an outcome so rare that it is more than three standard deviations, a 4.35% discrepancy. You'll probably have to run more than 1,000 iterations to get just one of those in your simple model with only 3,136 random trades. As I say, each reporting LBMA member essentially conducted its own internal survey of, on average, apparently, 170 "trades" per day. If those trades were "random" (as in not coordinated/one-directional) then, looking at my "trend" above, we could probably expect random discrepancy/deviation between purchases and sales from each reporting member after applying the "halving methodology" of the survey on the order of about 2% in any given day. When we (as a BB conducting our own internal "survey") aggregate 63 presumably random days, we now have an aggregate of 10,710 data points. So, after applying the final survey methodology, we'd expect to see, on average, a deviation of below 1.21% between purchase and sales. And then, as the LBMA aggregating these numbers from 36 separate reporting members, we would expect (presuming randomness/insignificance) a discrepancy of 1% or less given the aggregate number contains data points from 395,852 presumably random "trades" *after applying the "halving methodology"*. If it's not 1% or less (which it wasn't), then there must be another explanation." You seem to be saying, "no, no, there must be another explanation. You just don't understand how complex these bullion banks are. I do, because I'm a bullion professional who has direct dealings with them, and believe me, they are complex!" 4. A reckless abandon when reporting numbers (i.e., bogus numbers) which would render the entire survey meaningless. I suppose that is valid alternative explanation, but I thought we were working on the assumption that this is not the case. If so, I eagerly await your new, alternative explanation (as well as that sample iteration that doesn't produce a flow). We've been over this in our previous email exchange. I am not modelling 3,136 trades, which is the point you do not get. You cannot go any further in terms of data points. The "trend forming" was about getting more accurate models that reflects the survey, not about modelling more underlying trades. It does not matter if we could construct a model with 300,000 underlying trades or 900,000 trades, they only aggregate up to a maximum of 3136 data points upon which the LBMA methodology is applied and that is as far as you can model. 3) volume of client trading to BB trading, ie how much speculative trade do they do off client flow? It is only by exploring these scenarios that we can determine how much the LBMA methodology may distort the underlying buy-sell difference reality. Before I want to come to any conclusions about the results of the LBMA survey I want to understand how the methodology works. You don't to understand that we are not “well past this point” and I think we are talking at cross purposes. “each reporting LBMA member essentially conducted its own internal survey” – just to check, when saying “survey” do you mean “sampled”? BTW, I had far too little client volume vs BB-to-BB volume. Tweaking the model gives an average discrepancy of -0.15% with a standard deviation of 5.14% over 1000 iterations. While that could explain away the LBMA result, I will not accept it and continue to refine my understanding. You'll just have to wait for me to do that. Sounds good, Bron! I think I've made my case for any prying eyes to decide for themselves and, like I said, I (we) eagerly await your studied conclusions and your Occam's-worthy explanation for the discrepancy between purchases and sales! These comments on Freebanking and how bullion banking works come from FOFOA's blog. I've assembled them here for my future reference convenience. If you are interested in this topic you'll find them useful. If this discussion thread starts up again, I'll append them to this post. Most of these authors explicitly distinguish the goal of accommodating changes in the demand for money through changes in nominal supply from that of stabilizing an index of prices. The two goals differ because general price movements may be caused by changes in productive efficiency, and not just by changes in the demand for money balances relative to nominal income. Offsetting price changes due to changes in productive efficiency would not preserve monetary equilibrium. Many past and present American monetarists would probably agree with the theoretical views of the European writers discussed above. Their preference for other policies—for price-level stabilization or a fixed money growth rate rule—stems, not from any theoretical disagreement, but from their view that these policies provide the best achievable approximation to the ideal of a truly demand-elastic money supply. Hoarding and money destruction cause a leakage in the circular flow of income; dishoarding and money creation make, so to speak, new purchasing power spring from nowhere. In the first case, that of pure supply [of non-money goods], the situation is deflationary, in the second, where pure demand occurs, it is inflationary; in neither case does Say’s Law apply. If net pure demand is nil, monetary equilibrium prevails . . . the monetary equilibrium situation corresponds to Say’s Law [De Jong 1973, 24]. Machlup has the same view in mind when he writes (1940, 291 and 184-89) that “credit inflation is ‘healthy’ if it compensates for deflation through current net hoarding, or for an increase in the number of cash balances or in the number of ‘stopping stations’ in the money flow” and that credit contraction is healthy if it compensates for dishoarding (“a decrease in idle balances”). Good to see you are getting some use from my free banking link. I have a theory that the bullion banking system operates very much like free banking, considering they don't have a central bank who can print gold. I don't think there is much room for doubt that the clearing members operate on a free banking model. From a bullion bank's perspective this is the next best option to having a central bank. IMO it would be a big stretch to think they invented something totally new in banking when the free banking model was available "off the shelf". Factor GLD into the picture and you have the emergency liquidity function of a central bank as well. GLD ensures that they can always get gold at some price provided they can get their hands on GLD shares. Folks who have brokerage accounts with these banks in which they hold GLD shares which are registered to the brokerage would make this easy to do without tipping their hand. Obviously they could still be exposed to a cash loss if the price of gold moves against them but, as you know, they have plenty of ways to hedge. Under normal conditions this overall structure should be low risk for the BBs. As I said in my article, I don't see a lot of borrowing going on in GLD so it doesn't seem like bullion banks are using it as a source of liquidity. However, pre-ETFs retail investment would have went into coins/bars and thus would not have been accessible. With ETFs and street name registration, you are correct that now this metal can be borrowed directly from investors' brokers. So it has increased potential liquidity I suppose. I don't really think much of the "get physical by buying GLD shares" theory as raising the price to induce sellers works just as well in the OTC market - that strategy is nothing special to ETFs. Secondly, if they are going to hedge it then they just create an arbitrage for someone else to take advantage of, which negates the strategy. Note the above strategy works if only one or two are doing it for little volume - it doesn't work if they are all desperate for physical, which is the situation I think we are all interested in. I don't see a lot of borrowing going on in GLD so it doesn't seem like bullion banks are using it as a source of liquidity. Noted. It makes sense that the BBs will source from the best option under normal conditions. The key phrase in my comment on GLD-as-CB is "emergency liquidity". And that doesn't preclude using GLD shares creatively as part of their overall book management and client servicing. ..the "get physical by buying GLD shares" theory as raising the price to induce sellers works just as well in the OTC market.. Agreed. All of these theories based on what the punters can see are doubtful to say the least. This market is mostly opaque. ...it doesn't work if they are all desperate for physical..
Again this is where I'm also 180 degrees opposite the goldbug and silverbug pundits who scream about how much pressure the BBs are under for X reason or Y reason. The "spiders" have this game sewn up for now. It will take a crisis of some kind to change that and I think Jim Sinclair is dead right FWIW. The BBs will make out like bandits on the upside as well. To clarify, I think the free-banking model is an 'analytical model', not a 'business model'. The question would be whether the conditions of bullion banking fit the conditions of the free-banking model, and thus whether the free-banking conclusions are applicable. First, free banking defined: free banking occurs when there is little bank regulation and no central bank to monopolize note (paper money) issue. Each bank issues its own notes as part of their liabilities. The author assumes a base of commodity money, by which I think he means precious metal coins minted by the sovereign. 1. Under free banking, the commodity base money would form the banking system reserves. Each bank would manage its own reserve ratio to maximize its profit (by profitably expanding the credit volume) while a) keeping in balance with the rest of the banking system and thus preventing its reserves from being drained by its competitors and b) keeping an emergency reserve in case random fluctuations in redemptions of its liabilities stack up against it. 2. The free banking system would be able to adjust to changes in demand for credit money, and should always keep the supply of credit in balance with its demand. 3. These conclusions do not hold when a central bank monopolized note (paper money) issue, since in that case the CB notes tend to become the reserves of the banking system, and the CB must manage the reserves to manage the credit volume. 4. It is assumed that the public holds bank liabilities and the banks hold commodity money as the reserves; so far I have not seen discussion about the possibility of bank runs. The first is, as Bron suggests, that the bullion bank operations can be described by this model. I think he is correct. While the BBs do not issue ‘gold notes’ that circulate, I do not think that is the key to the model. The key, rather, is that there are no CB notes to use as a reserve upon which to expand credit. Interestingly, perhaps leased CB gold, i.e. ‘the CB’s good name on paper’, could have been a type of ‘reserve note’ used by the BBs before the launch of the Euro, so that the BBs transitioned from an informally-CB-backed system of sorts, to a completely free bank system. When I finish reading the book perhaps I will find some more insights into BB operations. 1. Who is transacting in all that gold that the LBMA clears? I previously had pictured paper gold as being something that you trade back and forth from within your own holdings, like switching your cash between currencies. But the LBMA clearing between members means that account holders are writing ‘unallocated gold checks’ to each other, and in very large amounts. I suppose this all goes back to the original ‘Red Baron’ question. 2. How do these gold transactions fit into a transition to freegold? How would they fit into a post-transition system? 3. How did bullion banking come about? Did it start with the closing of the Dollar gold window, or does it go back further? On the face of it, bullion banking is a strange concept. The second angle from which to view free banking is as a clue to how things might work after a transition to freegold. I do not thing central banks are going away any time soon, since, as the author notes, most central banks were chartered for the purpose of securing favorable borrowing terms for the government. 1. The commodity reserve floats in value. 2. The notes issues by the CBs float in exchange rates against each other. 3. Credit is issues into the economy by commercial banks which use the CB notes as a reserve, and thus credit volume is a step removed from reserve management. I think for this arrangement to work properly, clearings between CBs would have to happen quite often. A further implication of the 'CBs acting as free banks with gold reserves' system would be that the CBs gold would truly be the reserves of the banking system in that CBs zone. The amount of gold held would be proportional to how much credit gets cleared between a zone and the rest of the world. It's not an "analytical model" it's an operational model for a banking system without a CB. This kind of system operated at various times in various places. One of the most often cited examples operated in Scotland until around 1845 (if memory serves me). .... The arguments of both schools of thought — the School of Salamanca on the one hand and the Austrian school of economics on the other — are powerful critiques against the central banks' role in regulating interest rates (the price of the product) and money supply (the quantity of the product). It appears to be a fractional reserve system based on gold but instead of issuing notes (currency) like those Scottish banks they are writing other types of 'paper' contracts and settling in gold. The key feature of a free banking system is that the participating banks guarrantee to accept each others paper from clients on presentation. The banks then (as a group) settle those transactions among themselves. Instead of just relying on the good reputation of the participants the LBMA clearing members appear to have pooled their gold to underwrite the system. costata: "the gold which supports the paper they are issuing is held by this jointly owned company as an unallocated pool of around 700 m/t"
"... settlement instructions through an electronic settlement system hub called “AURUM” run by the not for profit company LPMCL. ... Each bullion clearing member uses their respective banks’ bullion operations group to control the clearing function." It is like a SWIFT for the six clearing bullion banks. Thanks for the correction. So let me see if I have this straight now. For the sake of simplicity let's ignore any other users of this system except the clearing members. Each clearing member has their own stock of bullion. After netting out the daily transactions conducted in-house by each clearing member they supply the data to the LPMCL AURUM system used to determine the external transfers required for physical settlement. LPMCL isn't involved in physical transfers. The clearing members arrange any inward or outward transfers of bullion from their stock required to settle with another clearing member. Does this describe the process as you understand it? Pretty well I think. In Selgin’s paper he does assume gold as the unprintable thing that the banks agree is the reserve which clears imbalances, that is, extinguishes liabilities between them. The key difference between freebanking and banking is that the reserve medium cannot be printed, it is fixed. I think this is needed otherwise there would not be a control over credit issuance by the banks in an environment where the amount of reserves changed/could be manipulated. Note that the paper was written in the late 80s, so the idea of bitcoins was not envisaged. Bitcoins would probably work fine as the reserve medium and maybe better than gold because with gold there is a small increase in its stocks every year. Selgin’s paper does not envisage gold circulating as money as that would not be practical. I think the idea that the gold is “still” in the banks’ reserves is compatible with the idea of gold as a store of value only. In essence freebanks are using gold purely as a SoV with bank paper circulating as the money. Only if you haven’t shifted your frame of reference to consider gold as an accounting unit. Perth Mint runs accounting books in gold and silver alongside our AUD accounts. Banks pay for our coins with unallocated gold, which we use to pay miners for their physical to make more coins. It is all very natural. costata, That is how I understand it. Keep in mind that one of the transactions is metal account transfers (no trade for cash). For example, Perth Mint requests JPM to transfer unallocated from the Perth Mint's account with JPM to Miner's account with HSBC. Clearing is a system by which HSBC will give the Miner unallocated and recognise a claim on JPM and JPM extingusih a liability to Perth Mint and recognise it has a liability to HSBC. Members offering clearing services utilise the unallocated gold and silver accounts they maintain between each other for the settlement of mutual trades as well as third party transfers. These transfers are conducted on behalf of clients and other members of the London bullion market in settlement of their own loco London bullion activities. This system avoids the security risks and costs that would be involved in the physical movement of bullion. So from an overall market perspective this network of BB owned unallocated pools (in aggregate) functions like a single virtual unallocated pool that provides the liquidity to the whole market and it's also the capital of the bullion bank clearing members. 3. the owing bank shipping physical to the owed bank's vaults. The above is probably in order of preference, so as to minimise physical movements. It may seem natural, but does the fabricator of copper pipe pay the smelter in unallocated copper, and does the copper miner sell in exchange for unallocated copper? Do cereal makers pay with unallocated Corn, and the grain elevators pay the farmers in same unallocated corn? It's not so strange that the gold industry pays in gold up and down the supply chain; rather, it is strange because it is the only industry to do so. Why is it special? Michael H: "It's not so strange that the gold industry pays in gold up and down the supply chain; rather, it is strange because it is the only industry to do so. Why is it special?" Because gold was once money. Just because we went off the gold standard didn't mean the infrastructure of gold accounts and borrowing and lending gold stopped, it just continued on and then got a real boost when miner financing by forward selling gold was created.